In this corner, weighing 7 pounds, 3 oz, is Abigail Barner, the newest addition to our witnessing force for Jesus here in Asia! In efforts to preach Jesus to the lost here on the island of Mindanao, Philippines, we face much unrest. Muslim terrorists threaten, politicians are jailed, the president is near impeachment for graft, and Communist rebels hold silent terror over rural mountain villagers. The people crave peace. Enter: Abigail, the peacemaker. In the Old Testament, another Abigail convinced David not to go to war. At her own expense, she placated his anger. She was a peacemaker. We need such a lady today. As with the hard to acquire needed peace in Mindanao, our own little Abigail did not come easily. 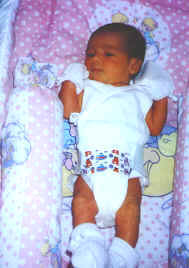 Her mom (Elvie) went through pain during five months of labor, beginning at the fourth month of pregnancy. The umbilical cord wrapped around Abby's neck threatened her life's breath. Your prayers brought about her final, safe delivery on 11/9 (also her daddy's birthday). During the Cesarean operation, the doctor sighed with relief as she unwound the loosely wrapped umbilical cord from Abigail's neck. Jesus brings true peace to a needy world. Your prayers make our efforts effectual. When we look down into the loving eyes of our darling daughter, we forget all the heartache, and see that all the prayers, all the struggles, all the expense� it was all worth it. And yet now, the task is just begun. Peace is fragile, yet rewarding. "doh wit dod!" Our 3-yr old son PJ had a concerned expression on his face after church the day of our congregational meeting, as he repeated, "doh wit dod!". Tying to translate from PJ language into English, I realized that he was informing me of an error I had made. Ending every worship service, after the prayer and benediction, I always challenge the congregation with "Go with God." Yet this Sunday I'd left out this phrase, for I wanted everyone to stay for the meeting. PJ just understood that this part of the service, which I'd never before realized that he noticed, was missing! Kids retain more than we realize! 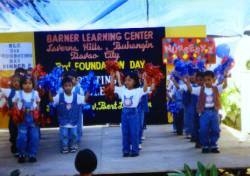 Barner Learning Center (BLC) is showing Tender Loving Care (TLC) to the poor people of Davao. The 4-lot school building borders on an overgrown vacant lot. To ward off snakes and rodents, some of the poor sponsored pupils' families offered to cut down the weeds and bushes. Then they planted lush flowers and vegetables in the freshly cleared unused vacant lot. Now they have food, both for their families and to sell.